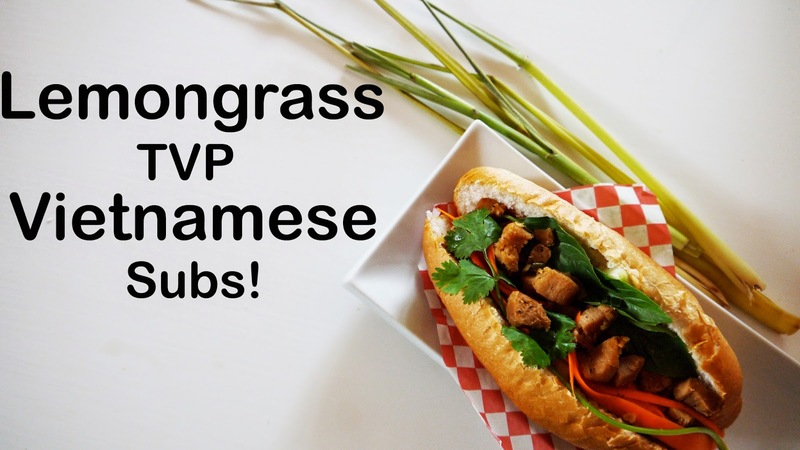 Vietnamese sandwiches or banh mi are growing in popularity and have become a regular street food across the country. For those who are new to the sandwich, it consists of a crunchy French-style baguette, or mini bun that its toasted to crisp, flakey perfection with the freshest fillings of crisp summer veggies and herbs. 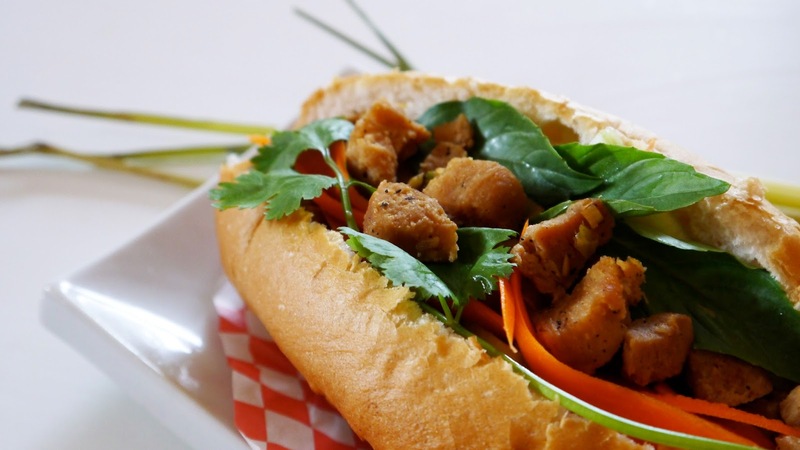 Vegetarian and vegan banh mi are not as common as the meat varieties, though some restaurants and stands offer tofu, seitan, or mushroom varieties. In this recipe I've decided to take the freshness of cilantro and cucumber and pair it with another refreshing ingredient, lemongrass. Soy chunks or textured vegetable protein (TVP) are great at sucking up flavours and work very well this simple marinade. TVP is quite inexpensive and is a great source of protein for vegans and vegetarians. It is usually found dried and just needs to be rehydrated in either water or broth plus a few of your favourite spices. In a large bowl, soak soy chunks in boiled water for half an hour. Drain and squeeze out extra liquid. Return the soy to the bowl. Add lemongrass, ginger, scallions and tamari to the soy chunks and stir, making sure that every piece is coated. In a jar or bowl add the carrots and vinegar. Let stand at least 10 minutes before using. In a food processor combine all ingredients. Blend for a minute or two until a smooth, adding more water if you wish for a thinner sauce. Cut the bun in half lengthwise like a submarine sandwich. Squirt on a generous amount of garlic aioli. Add freshly cut cucumber, cilantro and picked carrots (to taste). Fill with soy chunks and garnish with extra cilantro.